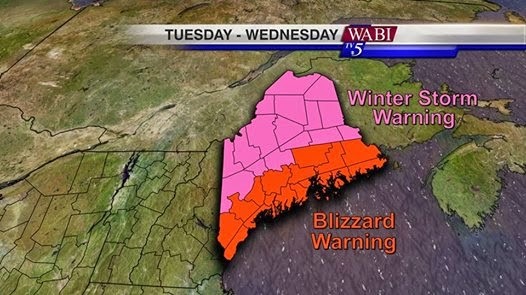 We have been upgraded and it looks like we are in for it later tonight; a good ole-fashioned blizzard. 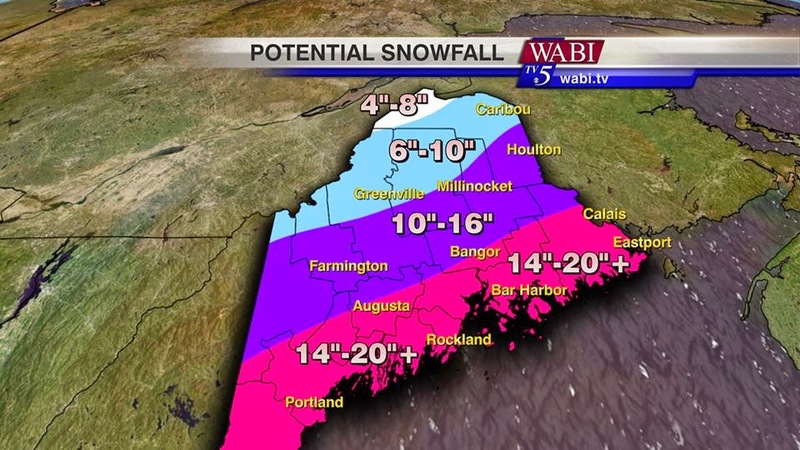 The forecasters on MPBN radio predicted we could be looking at 40 hours of straight snow with winds gusting 45-55 MPH. We live right on the edge of the white/blue band between Belfast and Bangor. Originally, there was a forecast of 15-20 inches of snow in our region. We still had a small hope of the storm blowing out to sea, but as time passed, that hope dwindled. Weather models revealed that we are in the line of the storm and need to take precautionary steps. 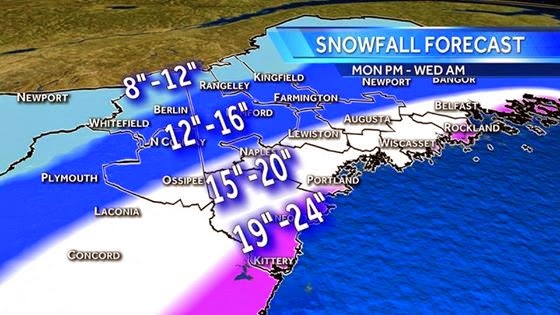 A blizzard is heading up the coast. In case we lose power, which seems likely, we brought in extra firewood, batteries for our electronic devices are all charged, and candles are at the ready. We'll fill the bathtub with water for flushing the toilet and for warming on the wood stove to wash dishes and cleaning. We have several Mason jars of fresh water for drinking ready in the fridge. A large pot of French Onion Soup will be simmering away on the wood stove and we picked up snack foods at the store for the girls that won't require heating. People sorted, we have a short window of opportunity to prepare for the additional work of storm weather animal care. We have plenty of grain stored up and hay at ready. Water containers will be brought inside overnight to keep from freezing or needing to be shoveled out of snow mounds or chiseled out of ice. Our turkeys are the biggest concern. Usually, they have been moved up to the barn already in preparation for winter. But, with the extra time spent at the shop and the relative mildness of weather so far this year, they are still housed in their regular pen. Sean added some extra protection from blowing winds in the form of a tarp secured over their shelter and extra hay for bedding and this has served well so far this winter. With what might be coming, we'll not take the risk of leaving them there. We raise Red Breasted Bronze and Blue Slate turkeys- both breeds are well suited to our cold, northern climate. When the chickens choose to remain inside under cover and even the more persistent ducks and geese decide the weather is not to their liking, the turkeys are often seen hanging in their yard, picking through the snow for anything interesting, impervious to the foul temperatures. We have found ours to be a hearty stock. They have sailed through every small storm we've had in their regular pen. But, with the potential of several feet of snow coupled with howling winds and freezing temperatures, the turkeys are being moved this afternoon when Sean returns home from work. We'll secure a couple panels of the movable fencing we built last spring and create a space for them in the barn. We considered allowing them to roam the barn freely, but we have young chicks and juvenile guineas living un-penned upstairs. The turkeys might see them as a~neat, new companions, b~competition for food, or c~ food itself! Options B & C being less desirable outcomes, fencing them into a secure spot is the best alternative. I think Ebony will appreciate their company more, too, safely separated from her mound of hay. I'll try to post images and video of the storm to share with you. Stay safe, friends. Thanks for stopping by today. How do you prepare for inclement weather? Stay safe, sounds like you are well pepared.....wish we would get more snow here in Utah, we are in need of it in the mountains for our snow pack for our summer irrigation water.